Every time I am asked to pray, I think of the old deacon who always prayed, 'Lord, prop us up on our leanin' side.' After hearing him pray that prayer many times, someone asked him why he prayed that prayer so fervently. It's still standing. But one day I noticed it was leaning to one side a bit. So I went and got some pine poles and propped it up on its leaning side so it wouldn't fall. Then I got to thinking about that and how much I was like that old barn. I've been around a long time. I've withstood a lot of life's storms. I've withstood a lot of bad weather in life, I've withstood a lot of hard times, and I'm still standing too. But I find myself leaning to one side from time to time, so I like to ask the Lord to prop us up on our leaning side, 'cause I figure a lot of us get to leaning at times. ...if you need propping up, call on Jesus! continue reading "Storms of Life"
Find out the different ways that we as the Body of Christ have allowed the world to creep into our thinking. And learn some of the dangerous side effects of these lies that are stopping us from connecting with God without us even realizing it. continue reading "You Can Be FREE!" 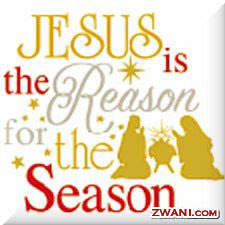 continue reading "Merry Christmas Jesus!" Have you picked up your gift from Jesus? There's a gift waiting for you...open it. continue reading "Christmas: His Nativity"
continue reading "Twas the Night Before Jesus Came"
He'll be washing our clothes anyway. He said something about new white robes and crowns for everyone who stays till the last. Communion with God, Forgiveness, Miracles, Healing, Power,Eternity in Paradise, Contentment, and much more! continue reading "A Party for Jesus!" excusing, forgetting, or ignoring their pain. They view it as weakness. In Why Forgive? Arnold lets the untidy experiences of ordinary people speak for themselves—people who have earned the right to talk about overcoming hurt, and about the peace of mind they have found in doing so. Why Forgive? examines life's more mundane battle scars as well: the persistent hobgoblins of backbiting, gossip, strained family ties, marriages gone cold, and tensions in the workplace. As in life, not every story has a happy ending—a fact Arnold refuses to skirt. The book also addresses the difficulty of forgiving oneself, the futility of blaming God, and the turmoil of those who simply cannot forgive, even though they try. Download your own FREE copy of Why Forgive? continue reading "People Get Ready..."
continue reading "Labor of Love"
Are you bound in sin? Are you a slave to ungodly, worldy habits? If you repent of your sin the power of the Holy Spirit will set you free! Today is the day to get rid of your chains of sin! continue reading "Still In The Spirit"
In the original creation, God made male and female to be together. Because of this, a man leaves father and mother, and in marriage he becomes one flesh with a woman—no longer two individuals, but forming a new unity. Because God created this organic union of the two sexes, no one should desecrate his art by cutting them apart." continue reading "Christ, Be the Center of My Life"
is NOW available to use as a ministry tool at your local church. impacted the marriages of millions of moviegoers. FIREPROOF Movie Events on New Year's Eve! By purchasing an official Site License—available NOW—a church or ministry has full legal permission to host public showings of the movie for one year. 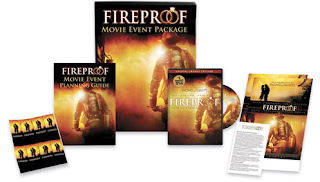 to provide the official Site License DVD for FIREPROOF Movie Events. ...and your community at large! 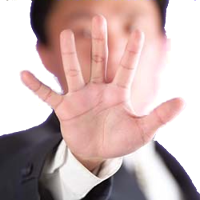 continue reading "FIREPROOF as a Ministry Tool"
One disliked the pastor, then there were nine. One slept in on Sunday, then there were eight. One took the low road, then there were seven. One disliked the music, then there were six. But one lost his interest, then there were five. But one stopped to rest, then there were four. One got her feelings hurt, then there were three. One joined the sports crowd, then there were two. Differed with each other, then there was one. Brought his friend to Bible study, then there were two. That doubled their number, then there were four. Each won another, then there were eight. In just a few short weeks, we’d have 1,024. You belong to the building, or the wrecking crew. continue reading "Ten Little Christians"
If you're looking for an online interactive advent calendar for your children, I have found a really neat one! As you know, advent calendars usually reveal a pretty picture, or a piece of chocolate to help children count down the days until Christmas. The Woodlands Junior Advent Calandar 2008 is an online advent calendar countdown! It has fascinating questions and facts about how Christmas is celebrated in different countries around the world. How fun is that? What an incredible teaching tool! continue reading "Online Advent Calendar"
A young couple moves into a new neighborhood.The next morning while they are eating breakfast, the young woman sees her neighbor hanging the wash outside. Her husband looked on, but remained silent.Every time her neighbor would hang her wash to dry, the young woman would make the same comments. 'Look, she has learned how to wash correctly. I wonder who taught her this? continue reading "Something to Think About. . ."
A new painting by Brian Daniel, just in time for Christmas. Performed at First Baptist Church Woodstock, Georgia during the Annual Christmas Festival along with members of the dance and drama teams. Watch as this painting transforms from a Nativity scene while "Mary Did You Know" is performed by the choir and orchestra. Please visit Brian's website at www.SeraphimOnline.com to learn more about his ministry, make booking arrangements and purchase artwork. continue reading "Christmas Jesus Painting"
The Power of One. . .
Last night, on twitter, I noticed many profile pics donned with santa hats, all in the spirit of Christmas! And thanx to my new friend @JaimieH on twitter, I am now celebrating Christmas with a new set of wings! continue reading "The Power of One. . ."
continue reading "It's About the Cross"
EMPOWERED is a free online magazine for Christian women in pursuit of God. Our mission is to EQUIP and EMPOWER women to live a life that honors God. Who Is The Empowered Woman? The Empowered woman is not satisfied with an ordinary life. She continually challenges herself and all she comes in contact with to take day to day living to the next level. She seeks a deeper relationship with her maker and with the family and friends that she holds dear to her heart. She is strong, confident, and savvy. She makes important decisions based on solid facts, yet still allows her heart to guide her. She continually strives towards a balanced life full of meaning and service to others. She does not allow fear, the opinion of others, or past failures to get in the way of achieving her God given destiny. She lives for an audience of one. She is EMPOWERED through grace daily. 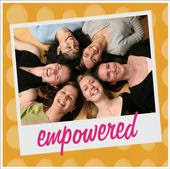 Sign up to receive your copy of Empowered Magazine today! And while you're there, check out the daily VICTORY verse and other encouraging e-banners that you can use on your own website or blog. Awhile back, I had the privilege of connecting with Anna Quesada, owner of Empowered Magazine! Anna is an amazing woman ~ she is incredibly compassionate and has a HUGE desire to see women achieve their God-Given Destiny! I'm so honored to know her and to share her ministry with you! Just found this wonderful Christmas giveaway on Laurel's blog at Laurel's Reflections. Beautiful Faith is an amazing CD that is filled to the brim with encouragement and hope! This collection of songs has resulted from the outpouring of God's faithfulness through times of trials and triumphs. Stop by Laurel's Reflections to enter to win your own copy! You can also read testimonies of God's faithfulness through these women, as well as listen to a sample of these songs. Winner will be chosen December 8, 2008. Even if you don't win, I know you will want to add this CD to your already growing collection. 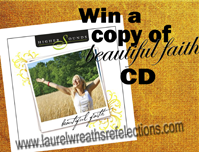 continue reading "Win A Copy of Beautiful Faith CD"
Each December, I vowed to make Christmas a calm and peaceful experience. I had cut back on nonessential obligations - extensive card writing, endless baking, decorating, and even overspending. Yet still, I found myself exhausted, unable to appreciate the precious family moments, and of course, the true meaning of Christmas.My son, Nicholas, was in kindergarten that year. It was an exciting season for a six year old. Nicholas was aglow, as were all of his classmates, adorned in fuzzy mittens, red sweaters, and bright snowcaps upon their heads. Those in the front row- center stage - held up large letters, one by one, to spell out the title of the song. As the class would sing 'C is for Christmas,' a child would hold up the letter C. Then, 'H is for Happy,' and on and on, until each child holding up his portion had presented the complete message, 'Christmas Love. 'The performance was going smoothly, until suddenly, we noticed her; a small, quiet, girl in the front row holding the letter 'M' upside down - totally unaware her letter 'M' appeared as a 'W'. The audience of 1st through 6th graders snickered at this little one's mistake. But she had no idea they were laughing at her, so she stood tall, proudly holding her 'W'. Please note: THANKS to my readers, I have been made aware that this poem is actually based on a true story. This true story, originally titled "Christmas Love", was written and copyrighted by Candy Chand of Rancho Murieta in Sacramento county California, author of several published inspirational works. BTW, if you'd like to own a copy, it's available as a small, single-story, hard-back gift book at stores all over the USA and online at Amazon. A perfect gift to remind us what CHRISTmas is all about! continue reading "The 'W' in Christmas"
For the month of December 2008, Christian Audio is offering a free audio download of Morning & Evening by C. H. Spurgeon. Includes the entire recorded months of January, February, and March. Since the penning of Morning and Evening over 100 years ago, this devotional classic has become hugely popular and been a favorite for millions worldwide. 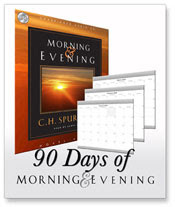 Stop by Christian Audio today, use the code DEC2008 to receive this months free audiobook download. Be sure to sign up for their newsletter; have the offers come right to your inbox. Each month christianaudio.com gives away a premium audiobook download for free. The Free Audiobook of the Month program works like this: one audiobook download is given away each month totally free; and it is only available for free once - ever. continue reading "Merry Christmas From Christian Audio"
Why did they take the Christ out of Christmas? Why did they let that part go? 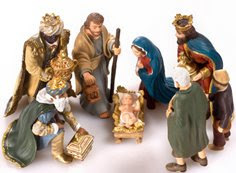 How did we forget the manger scene? Get shoved aside for the gifts that we carry? When did we lose the desire for His touch? Thank you Tamara for taking the time to share your poem with me; I know this poem will touch many hearts this Christmas season. Bless you, my sister, for sharing your work with us! The problems you face will either defeat you or develop you – depending on how you respond to them. Unfortunately, most people fail to see how God wants to use problems for good in their lives. They react foolishly and resent their problems rather than pausing to consider what benefit they might bring. Sometimes God must light a fire under you to get you moving. Problems often point us in a new direction and motivate us to change. Is God trying to get your attention? People are like tea bags... if you want to know what's inside them, just drop them into hot ever water! Has God tested your faith with a problem? What do problems reveal about you? Some lessons we learn only through pain and failure. It's likely that as a child your parents told you not to touch a hot stove. But you probably learned by being burned. Sometimes we only learn the value of something by losing it. A problem can be a blessing in disguise if it prevents you from being harmed by something more serious. Last year a friend was fired for refusing to do something unethical that his boss had asked him to do. His unemployment was a problem – but it saved him from being convicted and sent to prison a year later when management's actions were eventually discovered. Problems, when responded to correctly, are character builders. God is far more interested in your character than your comfort. Your relationship to God and your character are the only two things you're going to take with you into eternity. God is at work in your life – even when you don't recognize it or understand it. But it's so much easier when you surrender to his plan for your life. firstIMPRESSIONS is Pastor Satryan's weekly devotional email, sent to anyone who requests it. continue reading "Five Ways God Uses Problems"
November 28th - December 9th, 2008 - FREE! - presenting 12 of the greatest ladies in Christian ministry. that's sure to help you survive the holiday season this year! LIVE Global, interactive, webcast with the 12 ladies! and learn how they're surviving the holidays this year. from the ladies bringing you this spectacular event! continue reading "12 days, 12 women, 12 messages"
Day 2- a piece of grape gum- Grape gum! Grapes make jelly and juice, raisins and wine. But Jesus didn't need grapes to perform His first miracle. Read John 2:1-10. Day 3- a smiley face sticker-Here' s a smile! A smile usually expresses happiness. Jesus gave us many instructions to keep us happy. Read Matthew 5:1-12. Day 4- a few fish crackers-Fish! Well, if you were surprised to find these fish, wait until you read the story today! Others were surprised to find fish, too. Read Luke 5:4-7. Day 5- one birthday candle- A birthday candle? As you know , we are getting ready to celebrate Jesus' birthday. However, Jesus talked about something else related to this candle Light. Read Matthew 5:14-16. Day 6- a small jingle bell- You could make noise with this. But it would have bothered a certain man---until he met Jesus. Read Mark 7:31-37. Day 7- two candy fish - These would not go very far if you were really hungry! But Jesus could make much out of little. Surely He knew how to multiply! Read Matthew 14: 13-21. Day 8- two cotton balls- These cotton balls would be helpful in a thunder storm, wouldn't they? We could use them for ear plugs to muffle the loud noise that thunder makes. But we know Someone who doesn't need cotton. Jesus can control the weather. Read Matthew 8:23-27. Day 9- a piece of road map- People needing to use other parts of this map are in trouble! Don't you get lost today! Read John 14:1-6. Day 10- a small piece of soap- It's soap. Do you like to wash? Your hands and face? Behind your ears? Washing turn out to be a happy time for a man who met Jesus. Read John 9: 1-7. Day 11- a few candy hearts- Hearts. Wordlessly, they speak of love, don't they? Jesus spoke some commands about love. Read Matthew 22: 37-40. Day 12- a pin on button with a cross printed on it- we use crosses as a symbol, representing Jesus. Do you know why? Read Philippians 2: 1-11. Day 13- a small packet of salt- Ordinary salt. Yes, Jesus related salt to us and our behavior. He also gave us some advice. Read Matthew 5:13 and Colossians 4:6 (Notice that He doesn't recommend pepper!). Day 14 - a small bag of sand- Don't try to eat this ! It's sand. It reminds us that Jesus knows something about architecture, about buildings--- -and building lives. See His instructions; Read Matthew 7:24-29. Day 15- a small artificial flower- Flowers are pretty, aren't they? Jesus used flowers to teach us a reassuring lesson. read Matthew 6: 28-34. Day 16- a little box of raisins- Raisins! Many children are given raisins instead of candy for a snack. That's because they are a health-promoting and delicious fruit. Jesus told us how we can produce good fruit. Read John 15: 1-5. Day 17- a few flower seeds- Jesus told a story about seeds that a man planted. Then He explained it, revealing its deep meaning. Read Matthew 13:3-8 and Matthew 13: 18-23. Day 18- a sheet of music taken from a pamphlet type Christmas carol book- Christmas is just a week away! And here is an appropriate song. Sing it loudly! Read Psalm 100. Day 19- a little stone- A hard stone! Can you change this stone into a piece of bread? Do you think Jesus could? Jesus was asked to do just that. Do you know how He handled it? Read Matthew 4:1-4. Day 20- a piece of crumpled aluminum foil- Try to smooth out this piece of foil and use it as a mirror. It's hard to see your reflection plainly, isn't it? Many circumstances are hard to understand, but someday everything will be clear. 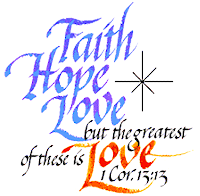 Read 1 Corinthians 13:12. Day 21- one mustard seed placed between two pieces of clear contact paper- The mustard seed is the smallest there is! When it sprouts, it grows into one of the largest plants! See what Jesus said. Read Matthew 17:20. Day 22- a tiny plastic dove- We've learned the cross represents Christ, but do you know what the dove stands for? Read Matthew 3:13-17. Day 23- a swatch of wool cloth- The thread that compose this fabric came from the wool of a sheep. Jesus called Himself the Good Shepherd. Do you know who his sheep are? Read John 10:7-18. Day 24- one blue marble- A marble! Do you know what is sometimes called the "Big Blue Marble"? The world. God made the world for us. What does God continue doing to the world? And who is the world? Read John 3:16. Day 25- a small photograph of a baby- Isn't this baby cute? When he was born, he made a whole family happy. Jesus was born a baby, too. He came to make the whole world happy. Read Luke 2:1-20. Continue to learn about Jesus---and love Him forever! continue reading "Christian Advent Gift Calendar"